Thrust into the pressure cooker of a high profile case, the struggling single parent is wound tight as he tries to balance care of his own family with the safety of a growing population of potential next victims. One of whom could be his own daughter. 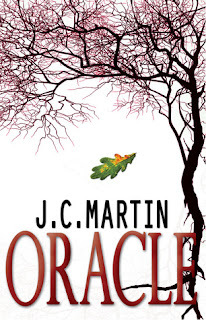 J.C. Martin captures the very essence of a mystery thriller in her debut novel, Oracle! It's twisted and elusive murderer keeps suspense building as each crime takes its toll on lead detective Kurt Lancer and his determined partners. Not only will Martin scare the living daylights out of her readers, but she will also give the story a sense of reality that only comes from having all the pieces of a mystery come together in the most unexpected ways. Oracle is a mystery that doesn't just focus on closing the case, but also takes into account the personal life of the characters. Lancer feels the pressure stemming from his daughter's declining eyesight and the urgency to catch a crazed killer. His partners Blaize and Holloway both battle with personal secrets that may or may not effect their work. With all that's going on with the cast, Martin still manages to make the 'Oaksecutioner' case the story's main focus. As the kind of story that will really make brain gears turn during investigation, Oracle proves to be the thriller of all thrillers as it's plot moves to a heart-racing and mind-blowing conclusion!